Some of you will know that this post has been delayed by a bizarre sporting accident – I was pretty much head-butted by an aggressive 14 year old field hockey player and have been reeling with a very nasty concussion for close to two weeks now. In a future post, I may explore head jolts in more detail – not, the “Attitude Adjustment” type of head jolts depicted in the old Hank Williams, Jr. song, but artificial means of stimulating the brainstorming state that follows a head injury, without the head injury! My lack of concentration of late does seem to come with lots of creative ideas: I just am not managing to record them anywhere before a new one occurs and takes me off in a new direction. For now, though, here’s a post I started when I was presenting at the CoRe Clinic Speaker Series on the topic of Myers-Briggs Type Indicator (MBTI) and Conflict Resolution. 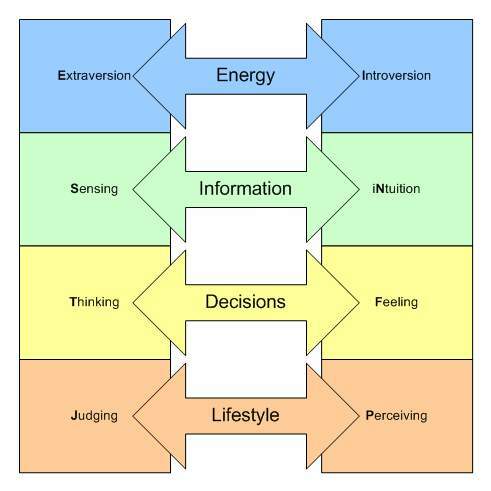 I had been focusing on how the MBTI can assist us to improve communications when we hit an impasse. Coming out of the second session, in particular, I’d like to suggest a “jolt” for each of the lead communication functions – S, N, T and F.
Now, while I know that there is a lot of information available on using the MBTI for sales and persuasion (which assumes that you listen for clues about people you are negotiating with and reply according to your best read of their type), my focus is more internal: rather than trying to improve communication by guessing at someone else’s type, the ideas contained in these jolts are about techniques to try based on your own MBTI preferences. We can be sure of our own preferences, and we improve our overall mediation and negotiation skills by identifying our own “blind spots” and finding ways to correct them. I’ll start with a very quick overview of psychological type for those readers who may not have been introduced to type before, but it will necessarily be incomplete and I very much encourage people who are interested to explore much more information than is provided here. A list of recommended books to start learning about type is included at the end of this entry. Psychological type is a theory of personality developed by Carl G. Jung to explain differences in patterns of behaviour amongst normal people. Jung determined that there are fundamental differences in the way people take in information (perceiving) and organize information in order to come to a decision (judging). He also observed that people tended to prefer one of two differing orientations of energy – extraversion and introversion. Katherine Briggs and Isabel Briggs Myers took up Jung’s theories and Briggs Myers worked to develop an instrument to help people determine how their own personalities mesh with Jung’s theories. The resulting instrument – the Myers-Briggs Type Indicator (MBTI) – is now a widely used psychometric tool with a very rich history of rigorous study and research. The middle two letters in the code represent the functions we prefer to use in taking in information (the perceiving functions, S and N) and making decisions (the judging functions, T and F). Type theory tells us that one of these four functions is our dominant function. It is the function that we developed earliest and use most readily, and so is our most comfortable. For extraverts, our dominant function is also our communication function: we use it in our dealings with the external world. For introverts, the auxiliary function – the second most developed function – is the communication function. How does it help us break impasses to know what our communication function is? Well, one common description of preferences in this context is to liken a preference for Sensing (as an example) to a preference for right-handedness. A right-handed person might be quite capable of doing many things with her left hand, but in crisis, she simply won’t reach with the left. Using the left hand takes more effort, and it may require conscious thought to choose it. Similarly, a person with a preference for Sensing can use Intuition, but in a conflict situation, may simply keep approaching the problem through Sensing unless he makes a conscious choice to try Intuition. The jolts below are ideas for each of the four communication functions on what they might not be doing because of the tendency to draw from one’s strongest functions – especially in conflict. For example, as an ENTP, my communication function is also my dominant INtuition. When I’m mediating or negotiating, I prefer to focus on the big picture and may resist parties’ efforts to “bog down in details”. This preference is so strong that I may (and certainly sometimes do) lose sight of the possibility of making use of details in a productive way. If the parties to a mediation both prefer Sensing, I may simply be frustrating them by insisting on big picture, future-oriented thinking. I don’t need to know that either or both of the parties are Sensors; I just need to know that I never seem to think of Sensing approaches to make a conscious choice to try one when at an impasse. It’s astonishing how often that choice helps. It jolts me out of a focus driven by my own preferences and helps me try something new that may work better for the parties. – Use a white board to collect details. There are a number of types of information that may be collected as a precursor to further discussion: a list of items to be discussed, a timeline of events, criteria for a resolution, criteria for what won’t work, etc. – In a negotiation, prepare a written proposal. You may change it on hearing what the other person has to say, but you will still have a detailed list to present and can show how you’ve adapted your prior thinking to recognize their interests. – Ask whether parties need to work through the details or whether it might work to spend some time thinking about a global solution? Do you need to decide who is “right” about the facts? Or could you each try to imagine a resolution that would work for you without reaching agreement on what it represents for each of you? – Identify and emphasize shared values rather than simply agreements on facts. – Create space for a friendlier exchange by shifting attention to sharing food, taking a break and regrouping with small talk, etc. Focus on creating a sense of comfort and harmony for the discussion to change the mood rather than trying to move people forward on the content. – Consider using a table of pros and cons with parties – either in private meetings or in joint session as appropriate to the specific context. – Use a risk analysis tool, like a decision tree, to help the party walk through a risk assessment of their case. Isabel Briggs Myers. Introduction to Type: A Guide to Understanding Your Results on the MBTI Instrument. Sondra Van Sant. Wired for Conflict: The role of personality in resolving differences. Carolyn Zeisset, The Art of Dialogue: exploring personality differences for more effective communication. The above books are available through the CoRe Clinic aStore. CoRe Clinic receives a small percentage from sales made through the aStore.